Our well-respected "Lesley" Double LP is now SOLD OUT and out of print.We are grateful to our fans for their support of Lesley's music. "Jazz Me," the companion CD, mastered directly from the original analog master is still available in limited quantity. The LP original matrix pressing was recorded and engineered by David Manley of VTL and Manley Labs fame. From the start, Manley insisted on his best-shot effort in all production, recording, and mastering aspects. The idea was to produce an absolute reference recording, without any technical concessions. Only purist recording techniques were used, with all music played "live" and captured straight onto two stereo tracks. Not only was the recording chain all tube, but it was entirely designed by David Manley - including a custom version of his Reference Gold stereo condenser microphone. Destined to become a classic Collector's prize! 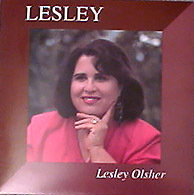 The most dynamic, natural recording of female voice on the market, "Lesley" is used as a "reference" by industry professionals world wide. No compression whatsoever! Caution: many systems are unable to handle the wide dynamics of Lesley's voice.